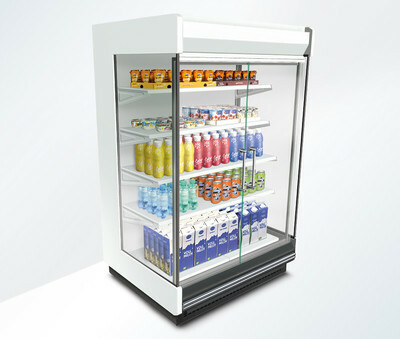 The VENTO FLEX 125 by AHT generates fast and fresh revenue in the dairy and convenience segments. As simple to use as AHT chilling and freezing chests, with compact dimensions and a sealed and self-sufficient refrigeration system – its features give VENTO FLEX 125 a competitive edge in supermarkets, convenience stores or filling stations. Creates new sales potential in individual or extension placement. Maximum mobility, minimal effort, low energy consumption and investment cost. VENTO FLEX 125 is the closed multideck for »Plug and Chill« in an attractive shop format, using the environment-friendly refrigerant R290! For convenience stores, supermarkets, filling stations etc. The AHT VENTO FLEX multideck guarantees ecological and economical chilling by using only the environment-friendly refrigerant R290. Perfect for extending existing installations or for placement at the POS. Due to the hermetically sealed refrigeration system, the leakage rate is 0 – meaning no refrigerant needs to be added. Ever.